Skaggi's House is the home of Skaggi Scar-Face and Sosia Tremellia. It is the last house on the left on the approach to Left Hand Mine, next door to Daighre's House. 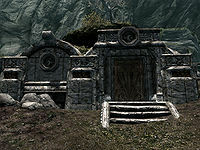 It is a single story Dwemer style dwelling, with a novice locked door. It is opposite the smelter outside of the mine. A goat can be found wandering around outside. The house consists of a single room with a large fireplace on the east wall with two cooking pots in front and a third pot containing a rabbit haunch and carrot. To the left of the fireplace, on the floor is a mead barrel and basket containing two sheaves of wheat, a cabbage and a potato, while to the right is a pile of firewood. Opposite the fireplace, coming out from the west wall is a large double bed with an end table to the right holding a bunch of juniper berries and two bunches of jazbay grapes, one in a wooden bowl. 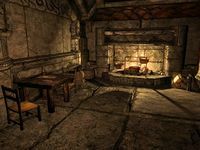 To the left of the bed, on a ledge is a copy of Killing - Before You're Killed and on the floor, in a bucket are copies of The Holds of Skyrim and The City of Stone. Against the south wall is an unlocked chest, while against the north wall is square wooden table and two chairs, with a loaf of bread and bottle of ale on the table.